It can be difficult to judge just how well a lugged steel frame is built. 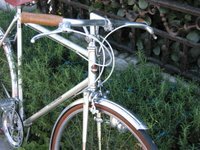 The average cyclist probably has a hard time seeing the difference in quality between a top custom frame and a good production frame. 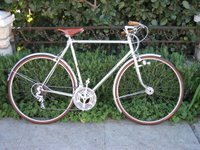 There are those who think that a production frame from Toyo, Colnogo, Waterford, or Maxway is virtually as well made, if not as well painted, as hand built frame by Peter Weigle, Johnny Coast, Richard Sachs, or any number of top custom builders. 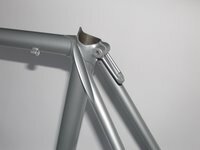 But if we look below the paint we'll soon find a lot that distinguishes good custom frames from even the best off-the-shelf frames. One of the things that's easy to spot and that distinguishes a production frame from a fine custom frame is the way the lugs are finished. As one of our regular readers put it when I asked about one of his American production frame , "It's never been in the same room as a file." "Geometric discontinuities cause an object to experience a local increase in the intensity of a stress field. The examples of shapes that cause these concentrations are: cracks, sharp corners, holes and, changes in the cross-sectional area of the object. High local stresses can cause the object to fail more quickly than if it wasn't there. Engineers must design the geometry to minimize stress concentrations." By thinning a lugs points the builders is able to make a more gradual transition and lessen the stress riser. 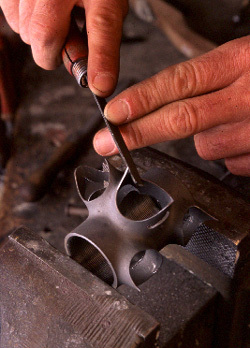 But filing lugs is done by hand and takes a great deal of time. This is time the production builder can't afford. 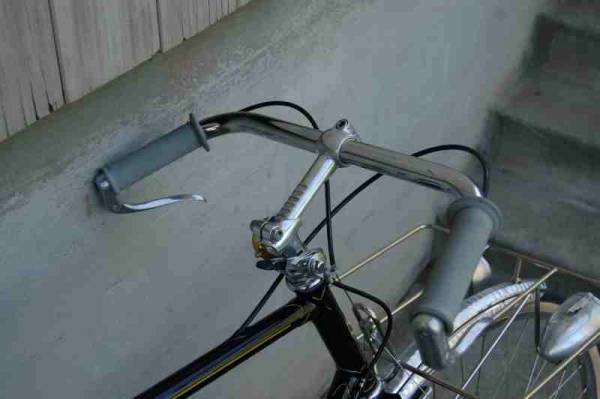 Besides, the frame probably won't crack if you don't file the lugs. 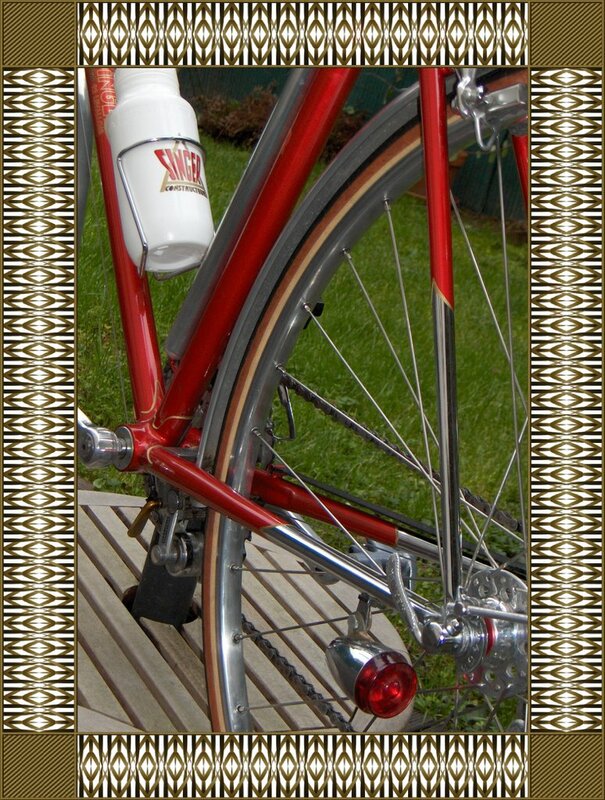 Likewise you'll notice that some points under the tubes of custom frames are, in fact, not pointed. Rather the builder has rounded them to minimize what is sometimes called the "can opener effect". The frame probably won't fail if those points are not rounded, but then again, why take the chance. 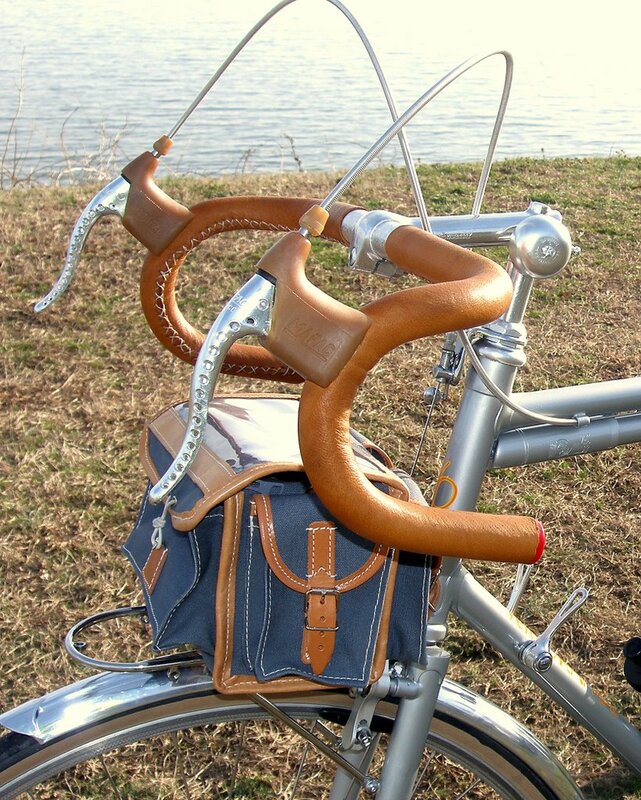 Thinning lugs also saves a little weight. It may not be much, but little details do add up. And finally, thinned lugs look a lot better. They show that the builder really cared. 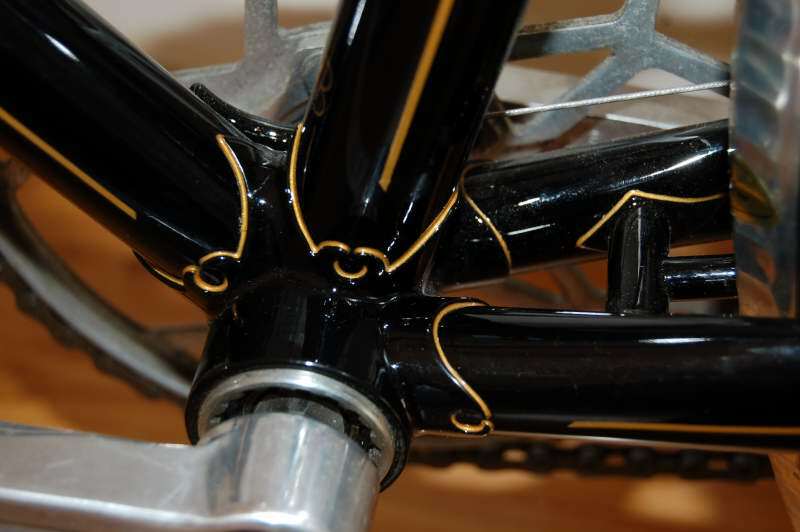 So next time someone tells you their production frame is as good as a custom, look at the lugs. In future posts I'll write about tube selection, mitering, alignment, and brazing. Our 7-year old has discovered YouTube and what he likes to watch is Keirin racing. I must admit that I can't help but be fascinated with Keirin racing as well. Watch a couple of these and you'll be hooked. The keirin is a mass start Track cycling event in which 6 to 9 sprinters compete at one time in a race with a paced-start. Riders draw lots to determine starting positions and start as the pacer (which could be a motorcycle, a derny, or a tandem bicycle, for example) approaches. The riders are required to remain behind the pacer, which starts at the deliberately slow speed of about 25 km/h, gradually increasing in speed and leaves the track approximately 600-700 meters before the end, at a speed of about 50 km/h. The first cyclist to finish the race is the winner (sometimes finishing at 70 km/h). Keirin races are about 2 kilometers in length (8 laps on a 250m track, 6 laps on a 333m track, and 5 laps on a 400m track). In competitions, this event is often conducted in several rounds in order to reduce the number of competitors to one "final" round of 6-9 riders. Eliminated cyclists may get the opportunity try again in the repechages. Keirin began in 1948 in Japan, and has become very popular there as a betting sport. 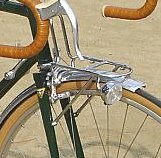 In 1957, the Japanese Keirin Association was founded to establish a uniform system of standards for the sport in Japan. 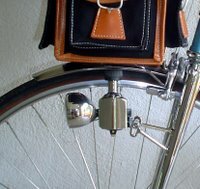 Japanese cyclists do not usually feature in the medal contenders for this event at international championships, largely due to the fact that the Japanese keirin circuit is more lucrative and prestigious for the Japanese than are competitions such as the world championships and the Olympic Games. 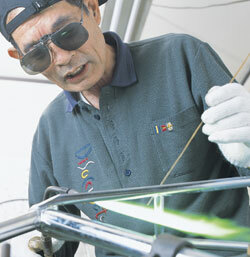 Koichi Nakano was one of the first Japanese keirin riders to compete outside Japan. 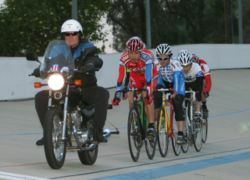 Aspiring professional keirin riders in Japan compete for entrance into the Japan Keirin School. The 10 per cent of applicants who are accepted then undergo a strict, 15-hours per day, training regime. Those who pass the graduation exams, and are approved by the Nihon Jitensha Shinkokai become eligible for professional keirin races in Japan. 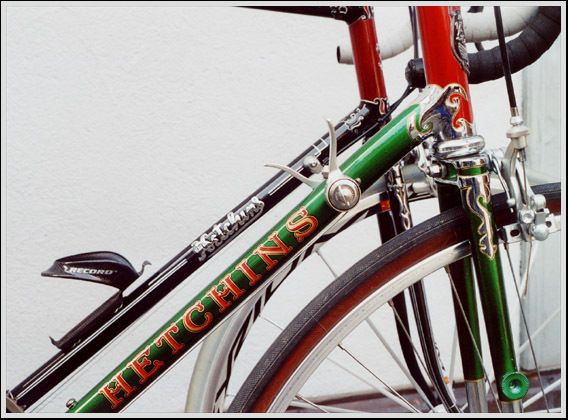 Keirin racing became an event at the 2000 Summer Olympics in 2000 at Sydney, Australia. The rest of this article is linked here. The 59th Japanese championship is exciting. 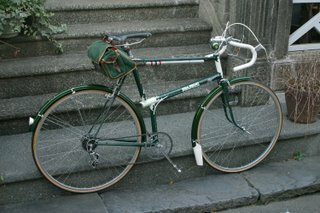 I'll put up a post about Keirin bikes and NJS components soon. Jason Byrne built the frame on the left, his 5th. Given the color, choice of Ostrich bags, lighting, etc, I love it. I hope Jason posts a comment with more details. 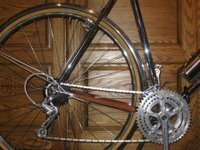 Like most JT's, it has an eclectic mix of parts, reflecting the builders' views of the best components available at the time. 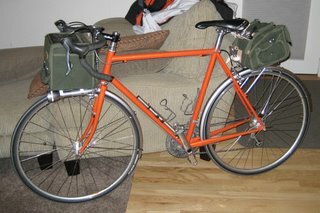 This one has Campy NR cranks, shift levers, and front derailleur, Simplex SLJ 500 rear derailleur, Phil Wood hubs, bottom bracket, and pedals(! ), Soubitez generator and lights with internal wiring, and JT's own custom racks. 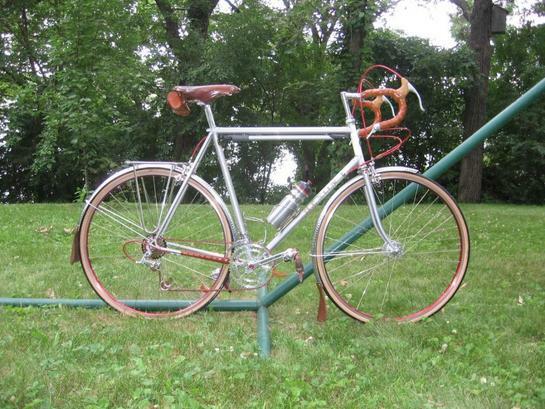 Bob Rogen sent a link to photos of his drop-dead-gorgeous Steve Rex-built city bike. It's even orange. 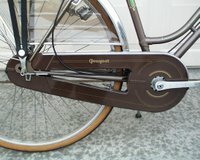 I hope our city bikes look as nice. 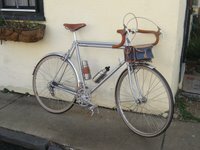 Here are a few photos of my city bike in the country. 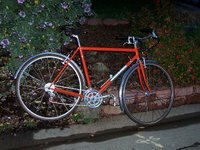 It’s an early 70’s Peugeot that I set up as a 1x6 with flat bars. I like the mix of old and new on this bike, especially the wrapped and shellacked bar-end’s and brake levers. She’s a great around town bike and lot’s of fun to just lean against a tree and stare at. 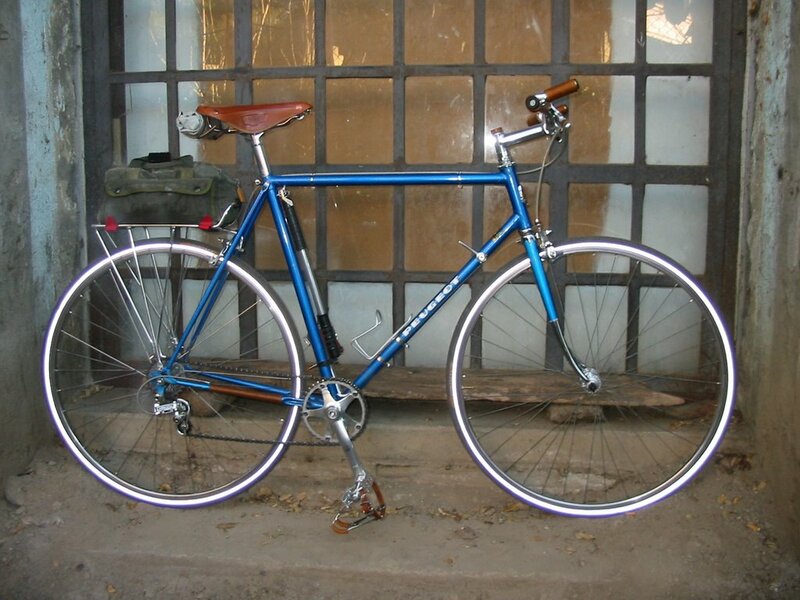 The quality and range of bikes being built in Japan today is very impressive. Here is a partaial list of Japanese frame builders. There are probably a few you were not familiar with. Most of these are links, a few are just shots of frames. There are a few that need links if you can provide them. I'll add to this list today and in the future. Toyo (the folks who may build our production frames.) And you must see this! Though they are a little off our focus, the British built some fine bikes. Why, some Jack Taylor models could almost pass for French. I am thinking about this because Shigeo Toyoda emailed and introduced me to his wonderful British Lightweight site. Of course it's in Japanese, but we have those great translation engines now. (I've mentioned this before, but the Firefox browser with the FoxLingo extention makes it fast and painless to translate sites from almost any language and it's free). 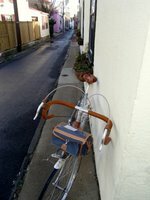 The photo at left is of a Paris Galibier (yes it's British) from Shigeo-san's site. The collection of photos there is astounding. 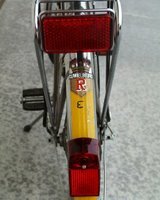 Here are a few other sites for interesting British bikes. Please add any additional links in the comments. The Classic Rendezvous British page will give you an idea of just how many classic British marques there are. 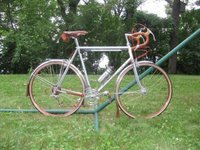 The Lake Pepin 3-Speed Tour is a neat event. 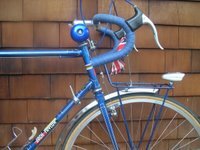 Joel Metz has a great page devoted to Jack Taylor bikes. 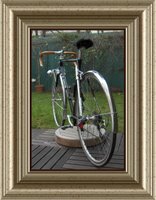 Also check out Joel's pages devoted to French components and little known builders that are linked from this page. This is just a start, you could follow the links for weeks. Alec, our 7-year old, loves to take a 10-25 mile spin with me on weekends, but he is disappointed if I ride a rando bike; it must be a racing bike. His heroes are TdF racers. He even has a poster in his room signed by Eddy Merckx. On one of our first family bike rides, when he was four and still on a tag-a-long, he says, "Now Dad; lets hammer! Drop Mom." This has me thinking -- Herse, Singer, Toei, etc, built "course route", or racing bikes. Toei also builds those wonderful pass hunters. So what if we took the Randonnuese frame and lightened it a little. Perhaps we could shorten the chain stays by 1 cm, use slightly lighter tubes, leave off the front rack mount (you could still use a Mafac/TA rack) and add a touch more trail. But we would leave the tire clearance. I would run 25mm Michelin's on mine, but there would be room for 32mm cyclo-cross tires in case one wanted to pass hunt on unpaved roads. The brakes would be the same fantastic braze-on mounted Paul Racers. We could build this bike in steel, or in titanium. What do you think? The Herse photo is from the superb reneherse.com site. 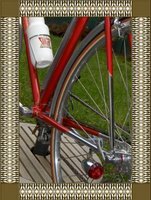 Recently hub generators have drawn a lot of current in the bike blogs, but there is good reason to favor the old bottle generator. 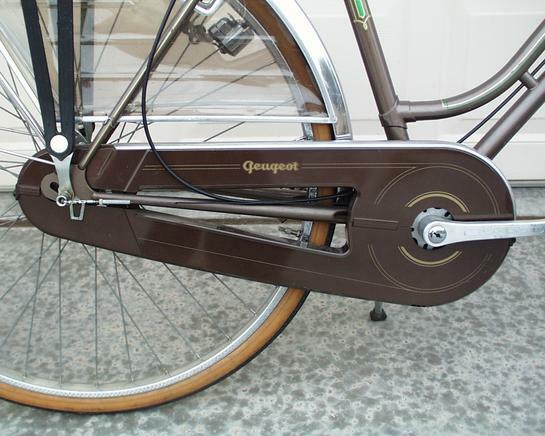 A good sidewall dynamo creates only a very tiny bit more drag than a hub generator, but only when in use. 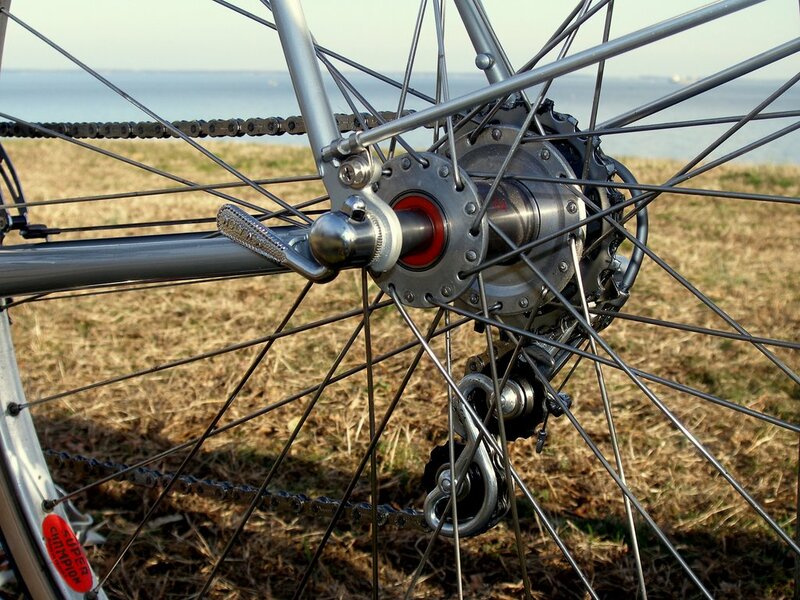 Unlike a hub generator, it creates no additional drag when in the "off" position. You can change wheels without loosing power. And bottle dynamos cost a lot less. I also like the retro look of a bottle generator. On the down side, they can slip in wet conditions if not carefully set up. And some add can wear to the tire. Of course it is also possible to set them up to run on the rim. We found some new-old-stock Soubitez 89 dynamos with golf "ball lights". What's cool about these is that the light can be detached and mounted on a fender or on a rack. 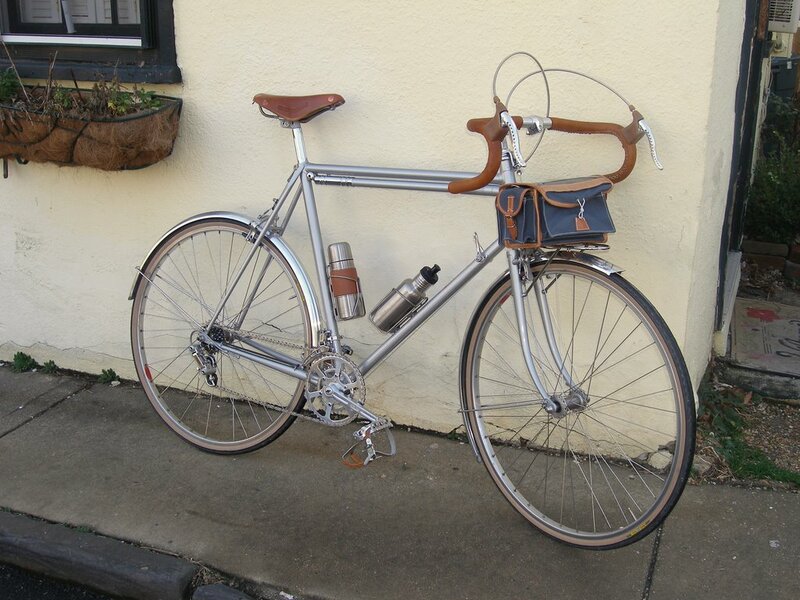 Or you can leave it attached to the dynamo for an uncluttered look, as David did on his Peugeot. These put out just as much power as a hub generator, but the bulbs are 1950 technology so they are not as bright as a modern light. I'll have some of the little rubber caps for the generator wheel soon. We've just started stocking Busch and Muller generators and lights. 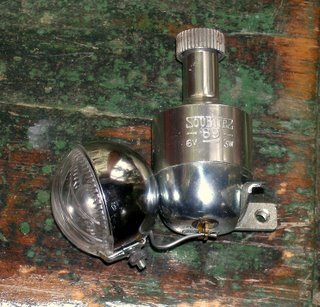 We currently have the two 6 volt dynamos as well as two styles of lights. 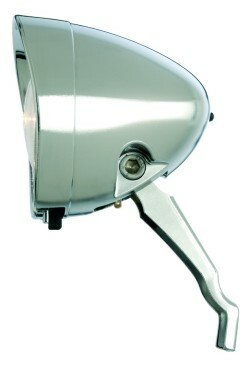 The cool aluminum retro light below is on order. The B&M Dymotec S6 is particularly attractive as it has about the same efficiency as a good hub generator, is virtually silent, and reaches full power at only 6 mph. 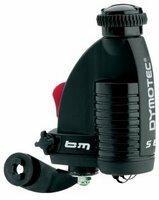 We also carry the very affordable Dymotec 6. We'll have them in the store within the next few days. And I think our prices will be among the lowest around. 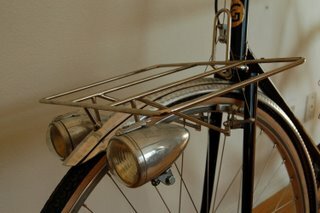 Also, we have the hard to find SALSA water bottle cages again. Here is a shot of our table this morning. They'll be in the store next week. 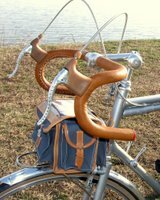 Please check out the cool bikes in the post below. It's a two post day. The bike photos are coming in faster than I can post them, so please don't be offended if I don't get to yours. 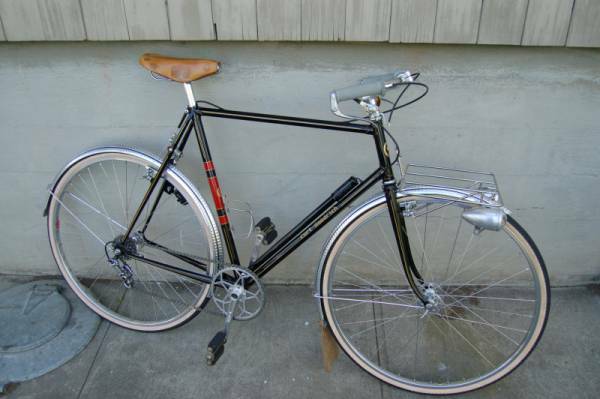 The Curt Goodrich Porteur on the left was built for BB, the same gentleman who commissioned this city bike. "I spent the better part of a year collecting all the vintage components ranging from NOS Nervex Super Leggere lugs to Mafac Drivers to the twin Radios headlamps. 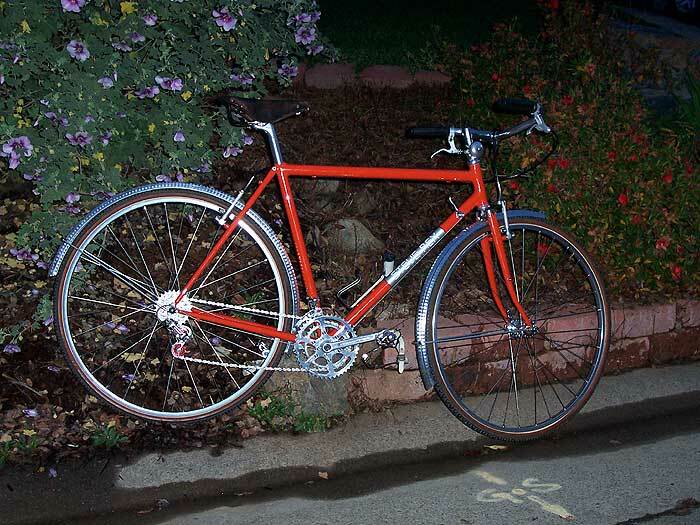 Curt built the frame and rack and did a spectacular job." "It is from about 1979 (based on S-A hub date of 5/79. I believe it is 100% stock and it appears to have been purchased in Amsterdam. It ended up costing me a bit over $200 which is probably on the high end of sensible, but I don't recall ever seeing another like it. The tail light suffered some damage in shipping but I found all the pieces and got it glued back together pretty well." The rest of Doug's photos are here. Nate sent the very cool photo of the Schwinn in the snow below (pun intended). Please post a comment with more info Nate. As most of you know 650B is a wheel and tire size that is slightly smaller than now standard 700c. 650B tires are typically larger and inflated to a lower pressure than 700c tires. But the overall outside diameter of a typical 650b tire is only a little smaller, since its a larger tire. 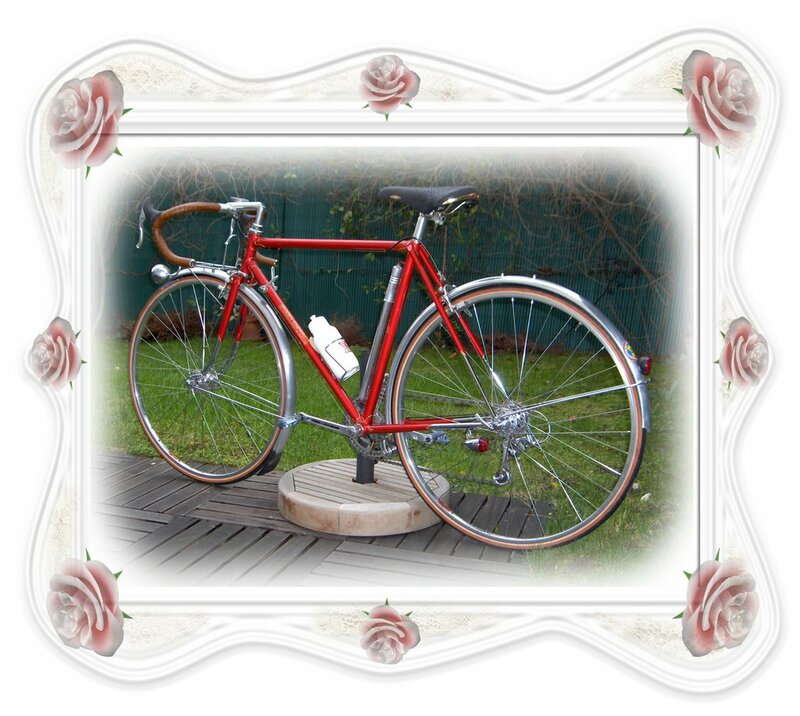 650b tire were popular in France and other European countries because they offered a more comfortable ride with rolling resistance virtually as low as that of a 700c tire. 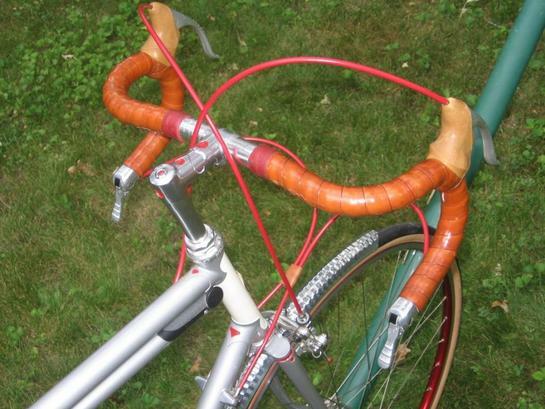 But as 700c tires dominated racing, they became the standard on all bikes. 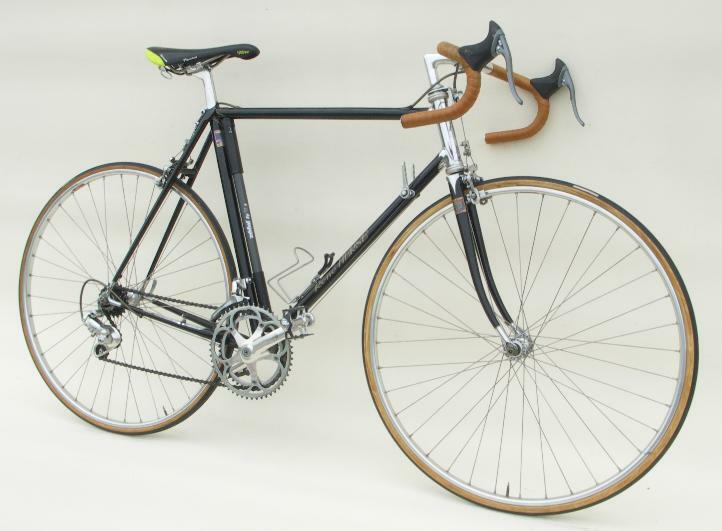 Recently there has been a revival in 650b bikes. 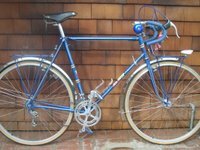 Many cyclist are rediscovering the plush ride of 650b. 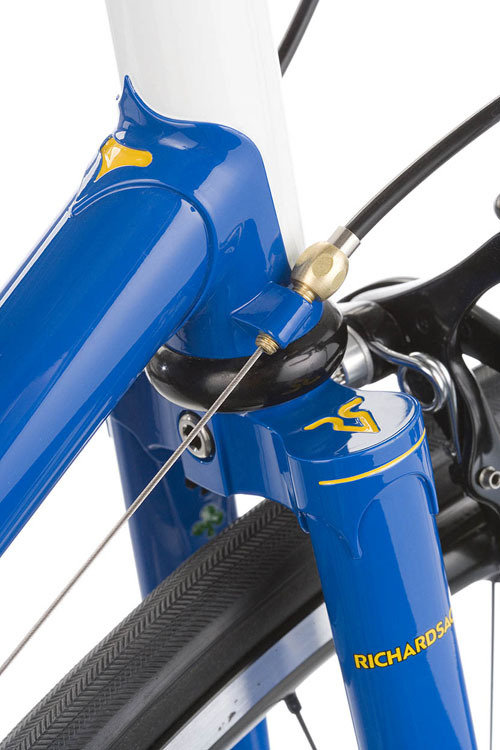 In fact for devotees, this size, between 26" mountain bike and 700c, is the golden mean. They go on endlessly about magic ride of wider lower pressure tires. In France the movement has been led by the Confrérie des 650. It's worth looking through their site, which is partially available in English. 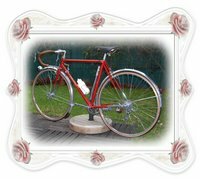 The 650b Wheeled Bicycle site also has good info. Rivendell Bikes, here in the states, is notable for offering several 650b production bikes. 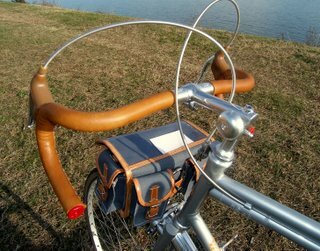 Here at Velo Orange we have three 650b bikes in the works, the Cyclo Touriste (a 650 verion of the Randonneuse) is available now, a mens-style city bike (which is now being built), and a mixte version of the city bike. 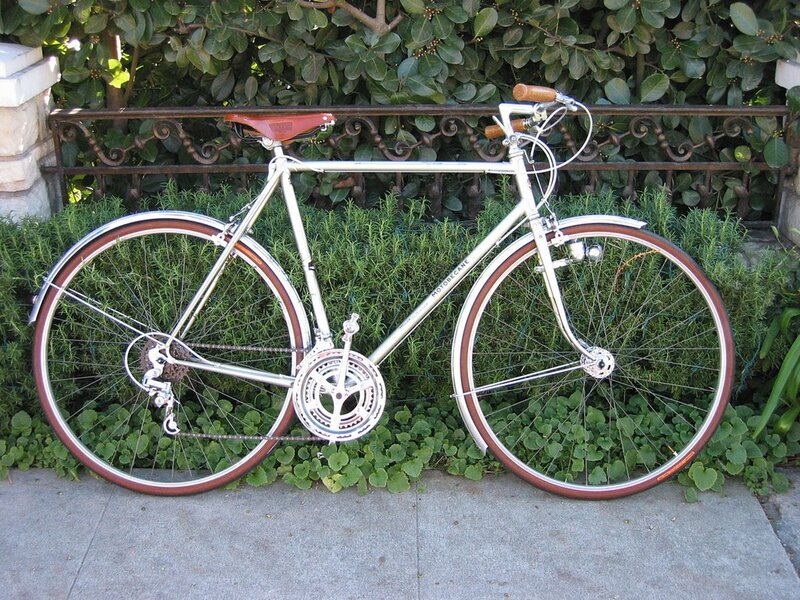 We're also considering the possibility of a mixte version of the Cyclo Touriste. We have a few 39mm (marked 44mm) Michelin World Tour tires and will be getting more. 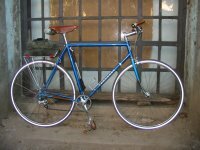 There is a nice stock of inexpensive Kenda tires that are perfect for city bikes. The Panaracer Col de la Vie 38mm tire we now stock is a very nice tire. 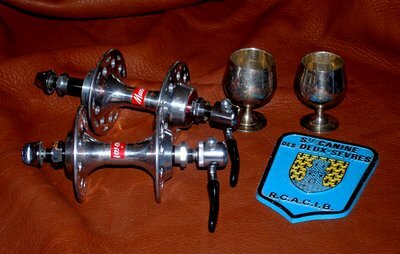 For rims we have now the French Rigida Sphinx rim in 36h. We'll be getting more models soon. I'll post photos and get them into the store soon. 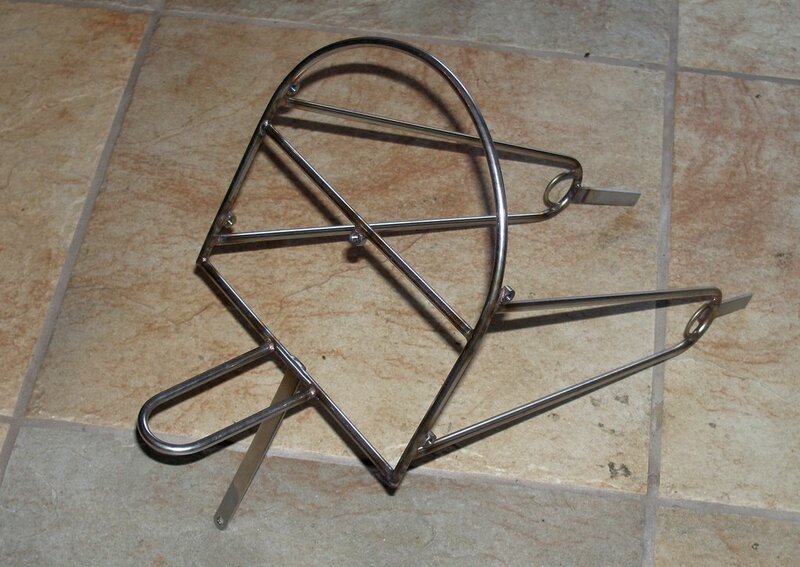 The photo is of the (still unpolished) prototype front rack for our 650b city bike. It's about the right size for a shopping bag, brief case, or a few books. We might also sell these separately. Do you like the curved front? Maxi-car hubs are the stuff of legend, 60,000 or 100,000, or more miles without need of a rebuild. 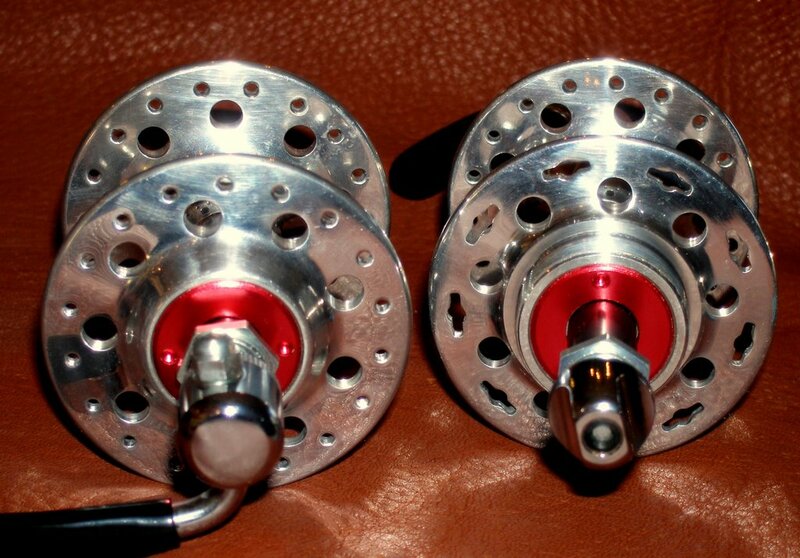 These are the hubs that came on the very very best bikes from Herse, Singer, and the other great constructeurs. They are still sought after by tandem riders for their strength and by randonneurs for their reliability and longevity. 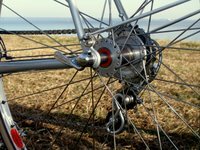 The holes in the drive side of the rear hub are like keyholes, allowing a broken spoke to be changed without removing the freewheel. The axles are oversize, like Phil Wood axles, and simply don't break. 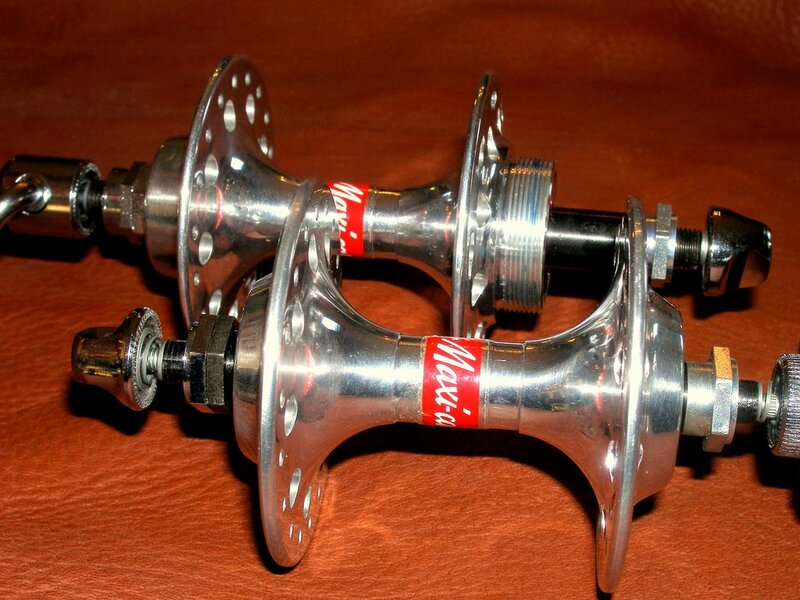 But unlike Phil Wood and other quality hubs, Maxi-car used annular bearings designed for not only up-and-down loads, but for side loads as well. Then they encased them in a labyrinth of seals. It's been estimated that there are twice as many machining steps required to make a Maxi-car hub as, say, a Phil Wood hub. 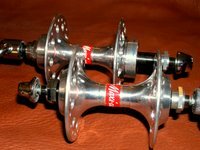 As with so many hand machined products, Maxi-car hubs simply became too costly to manufacture and the company was unwilling to spend the money required to develop a cassette hub. 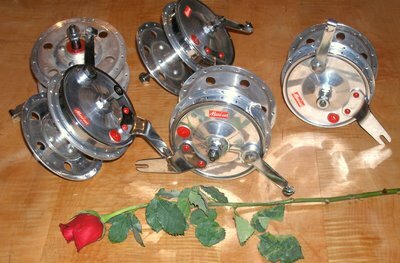 The company still exists and they still make hubs, but now they are made for wheelchairs. Here is a page with more information. The pair shown here are NOS from one of the very last production runs in the mid to late 1990s. They are going on VO randonneuse #1 . Here's a fun Maxi-car article. It's been unseasonably warm here in Annapolis, so I've been riding one of my favorite loops. 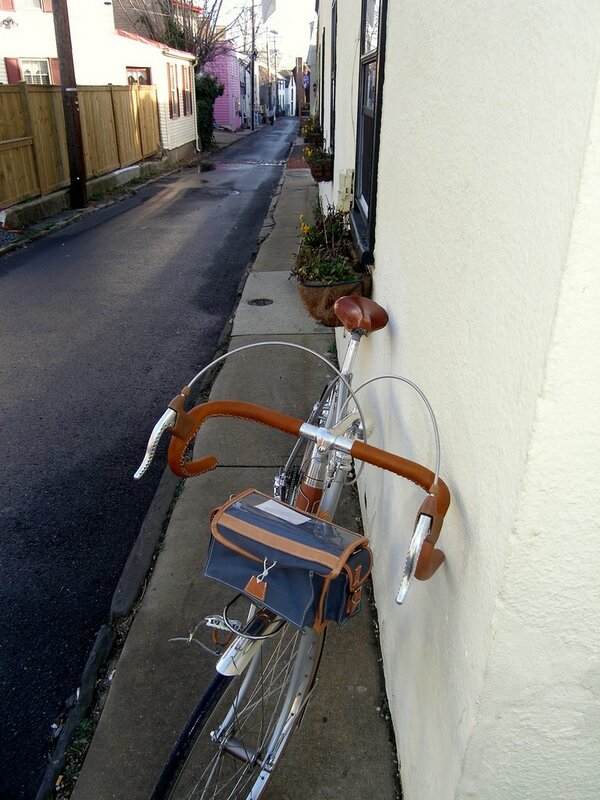 It goes along the shore of Chesapeake Bay and through the back streets of Annapolis. Yesterday I stopped to take a few photos, not of the scenery, but of the bike. 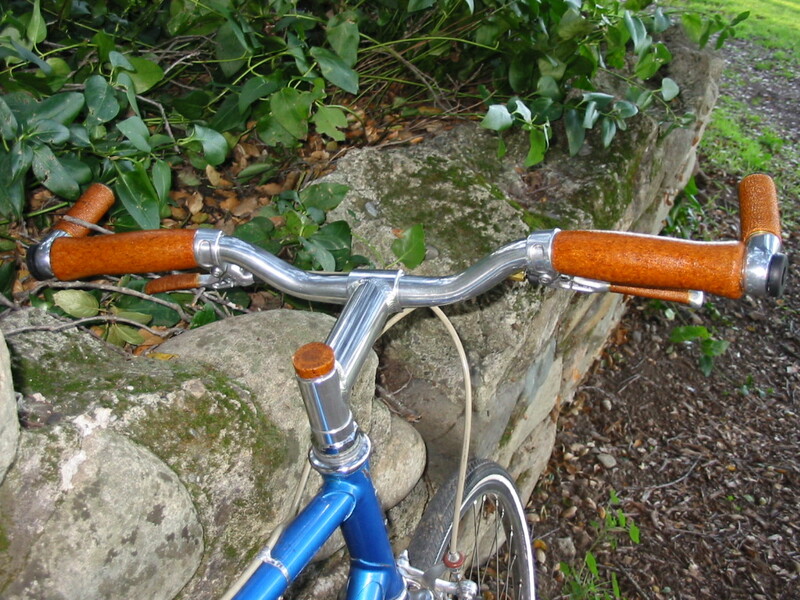 One thing I wanted to show was my new Mafac super light brake levers. I also love the macchiato elk hide handlebar wrap; it matches the Brooks honey saddle perfectly. There are more photos here. Johnny and I have been talking about the frame and decided to make two small changes. 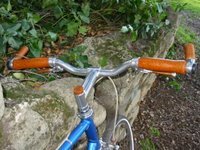 The seat stay caps will be changed from the long flutes to a flat semi-wrap style which will give the bike a more French look. 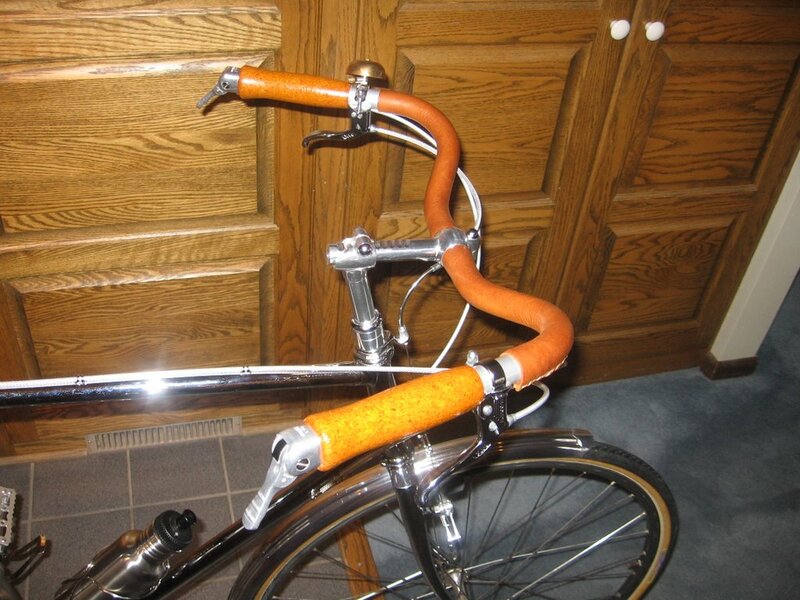 Though if anyone wants the flutes on their frame, I'm sure Johnny will be happy to use them instead. We will also eliminate the cutouts on the fork tangs of the Richard Sachs fork crown; they just look too Italian. 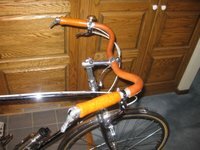 Judging by the number of requests for order forms we've been getting, I expect the current 5-6 month wait for a Velo-Orange frame to increase. Johnny says, based on his shop's experience, that many people wait too long and there is a big rush to order frames in early spring. Unfortunately that means that delivery is near the end of the warm weather riding season. Finally, the amount of e-mail we get here is growing at an amazing rate and occasionally a message gets blocked by the spam filter or I forget to flag it for follow-up. So if we don't answer in 48 hours, please accept our apologies and try again. 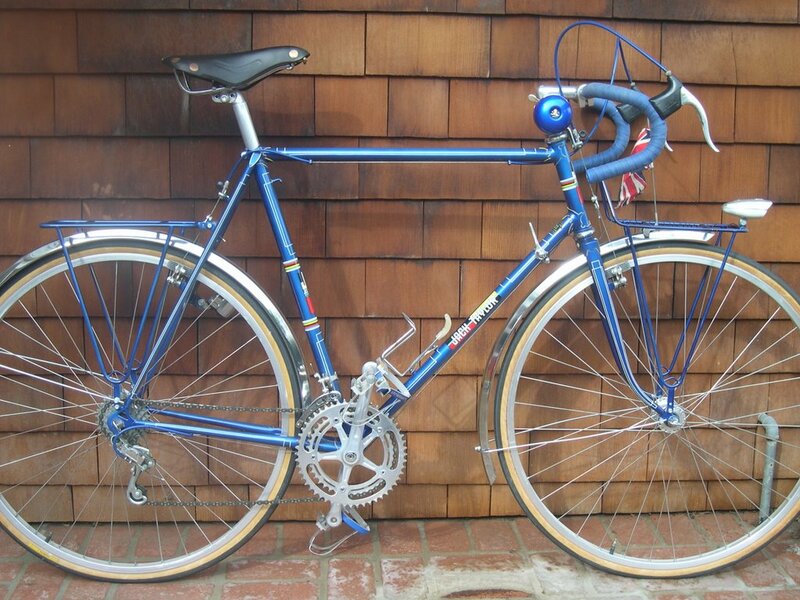 Bob Rogens Mariposa is a masterpiece by one of the best constructeurs working today, Mike Barry. 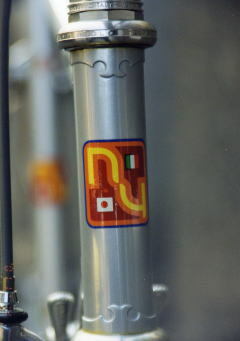 There is a wonderful series of photos of the bike here. Click on the photo to go to the next image. 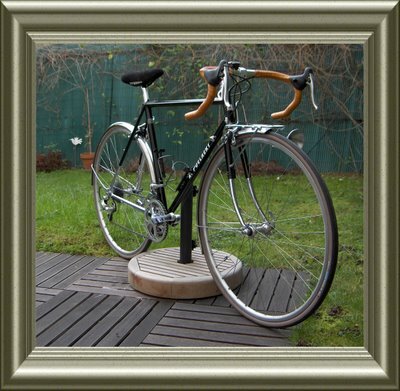 "After seeing the really fantastic bicycles you have posted I'm almost reluctant to submit this. I only do because it is done somewhat in your philosophy; 'cept it ain't French. 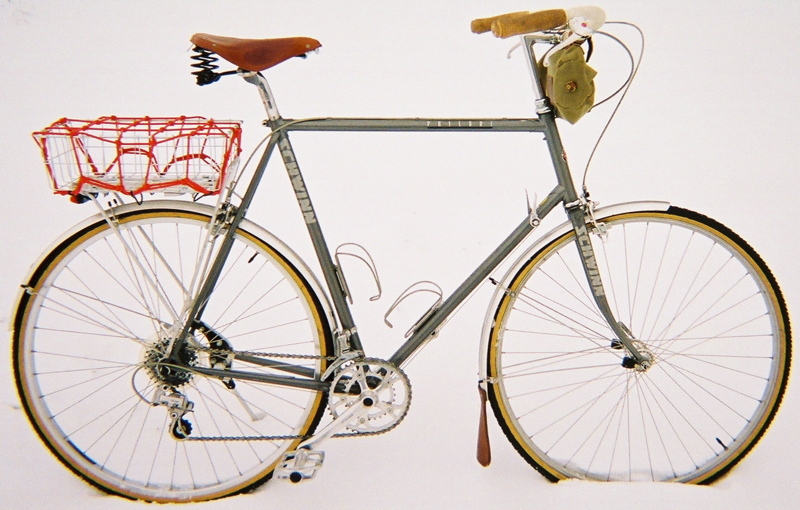 This is literally the last first generation 531 Heron built before they went out of business. 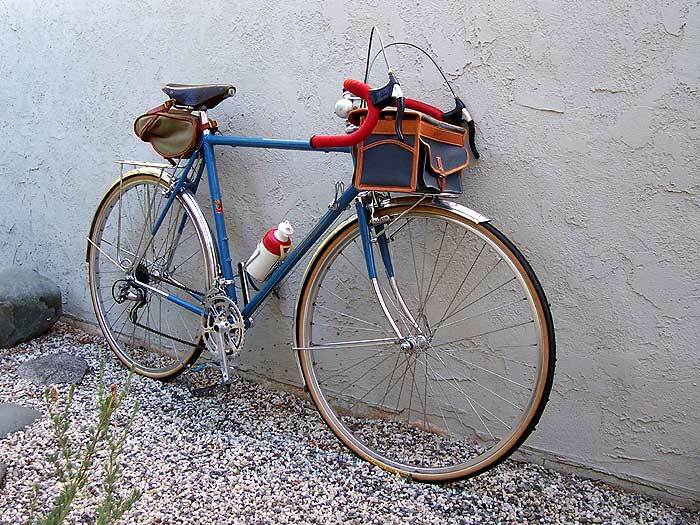 I also have small Berthoud panniers, and a watercolor set and block that mounts to the rack. A picnicker. 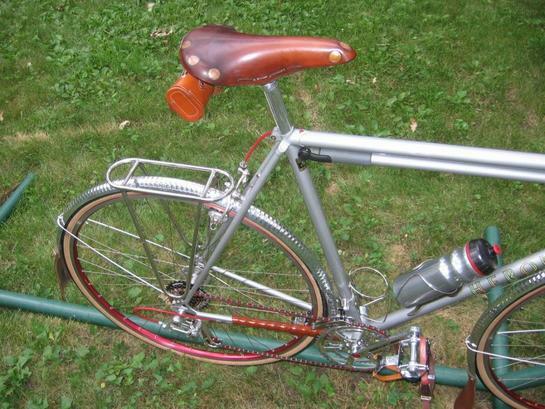 A wine bottle will fit the Nitto bottle racks perfectly." 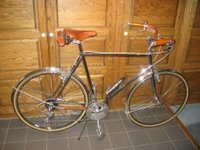 Monsieur Miton, who's fine randonneuse was featured yesterday, sent a number of photos that are well worth studying. I've posted them as an album on Photo Bucket to save bandwidth. Here is the link. The red Singer is gorgeous. 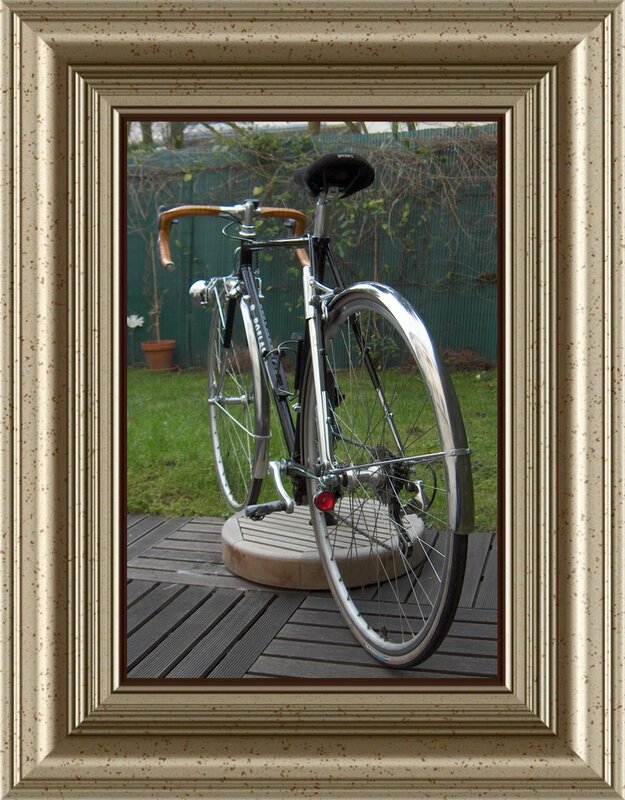 "Voici une photo de ma randonneuse de marque polaert région parisienne cette artisan a fait ces premieres armes chez mr herse tube reynolds tubes 753 campagnolo 9 vitesses daytona poid 10KG500 LA LIAISON ENTRE LE MODERNE ET L'ANCIEN"
I have always been a fan of Motobecanes. Of the Mass produced french brands they seemed to have the best geometry. David Barnblatt is restoring three of them. The photos on the right are of his first, and fine looking looking, city bike conversion. Note the Honjo fenders, NOS Soubitez light, and 3TTT style bars. 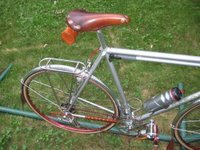 Speaking of city bikes Mr. Neil Berg has saved a Peter Mooney chrome frame that had been turned into a ghastly semi-race bike. 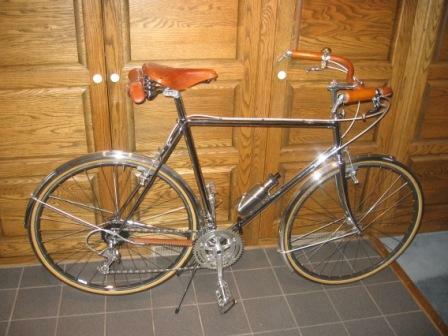 Neil returned the bike to it's city bike origins. The photos are below. Note the Campy Record triple crank, Rally derailleur, 3TTT style bars and smooth Honjos.